The concept of “narratives” often comes up in the context of Russian and pro-Kremlin disinformation and influence efforts. Some of these narratives have been in use for hundreds of years. Variations of the narrative of “The Decaying West” are documented since the 19th century. Narratives can be combined and modified based on current events and prevailing attitudes. Here is an overview of the five most common narratives that consistently appear in Russian and pro-Kremlin disinformation outlets. This narrative, broadly based on the idea that “evil elites” are out of touch with the needs of the “people”, is a common populist trope that can be especially powerful during election cycles. We have seen it many times before: a party or a candidate, claiming to be the “voice of the people” or “the silent majority”, deploys this narrative to attack the political establishment and offers voters easy solutions to complex problems. This narrative can be very successful as it provides a scapegoat for the target audience to blame for any grievances: bankers, Big Corporations, Jews, oligarchs, Muslims, Brussels bureaucrats. 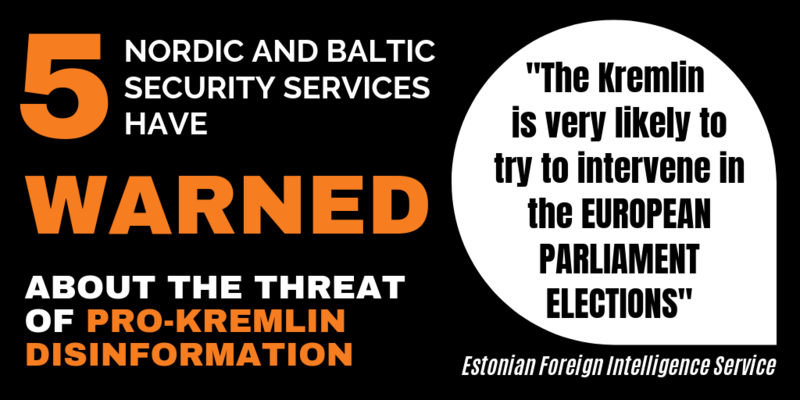 Russian and pro-Kremlin disinformation outlets heavily exploited this narrative on the eve of the 2016 Brexit referendum, as these two Sputnik articles demonstrate: “The Threat from Eurocracy threatens Europe” and “Waffen-EU”. Both stories resonated strongly with the Leave campaign. 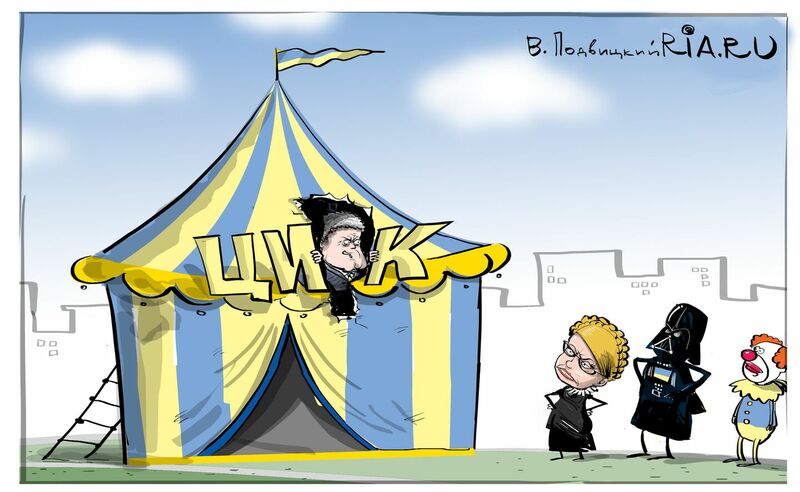 Questioning the legitimacy of the electoral process is also a common characteristic of this narrative. Sputnik, for example, frequently “reports” about alleged election fraud, underscoring the idea that elites manipulate elections. Here are examples about Germany (in German), Sweden (in Russian), and Ukraine (in Russian). Ultimately, while this narrative appears on its surface to sympathise with ordinary people, its roots are in fact strictly authoritarian. Evidence is rarely provided to substantiate the claims made and, following the principles of conspiracy thinking, the very absence of evidence is sometimes used as proof: “See how powerful the elites are, hiding all trace of their conspiracy!” Typically, this narrative also demands that the reader rely exclusively on the word of the narrator: “I know the truth, trust me!” Indeed, like all narratives based on conspiracy theories, this one requires its audiences to accept the claims on the basis of faith rather than fact. The narrative about “Threatened Values” is adapted to a wide range of topics and typically used to challenge progressive Western attitudes about the rights of women, ethnic and religious minorities, and LGBTQ groups, among others. According to this narrative, the “effeminate West” is rotting under the onslaught of decadence, feminism and “political correctness”, while Russia embodies traditional paternal values. This narrative is depicted in a 2015 cartoon by Russian state news agency RIA Novosti, illustrating Europe’s apparent moral decay: from Hitler, to sexual deviance, to a future of rabid hyenas. Value-based disinformation narratives usually centre on threatened concepts like “tradition”, “decency”, and “common sense” – terms that all have positive connotations but are rarely clearly defined. The narrative creates an “Us vs. Them” framework which suggests that those who are committed to traditional values are now threatened by those who oppose them and instead seek to establish a morally bankrupt dystopia. Russian and pro-Kremlin disinformation outlets pushed variations of this narrative in the run-up to the 2018 Swedish general election, as can be seen here and here. In Russian-language outlets, like the infamous St. Petersburg Troll Factory News Agency RIAFAN, the language of this narrative is particularly aggressive: “What it is like in the country of victorious tolerance: Gays and lesbians issue dictates, oppression of men and women, Russophobia and fear”. By contrast to the Western conception of values, which favours individual rights of personal integrity, safety, and freedom of expression, the Russian value system entails a set of collective norms that every individual is expected to conform to. Yet the narrative is always expressed from a position of moral high ground, in which the silent majority, committed to decency and traditionalism, is under attack from liberal “tyranny”. The target audience is invited to join the heroic ranks that are boldly fighting for family values, Christianity, and purity. Russian and pro-Kremlin disinformation sources like to claim that certain countries are no longer truly sovereign. 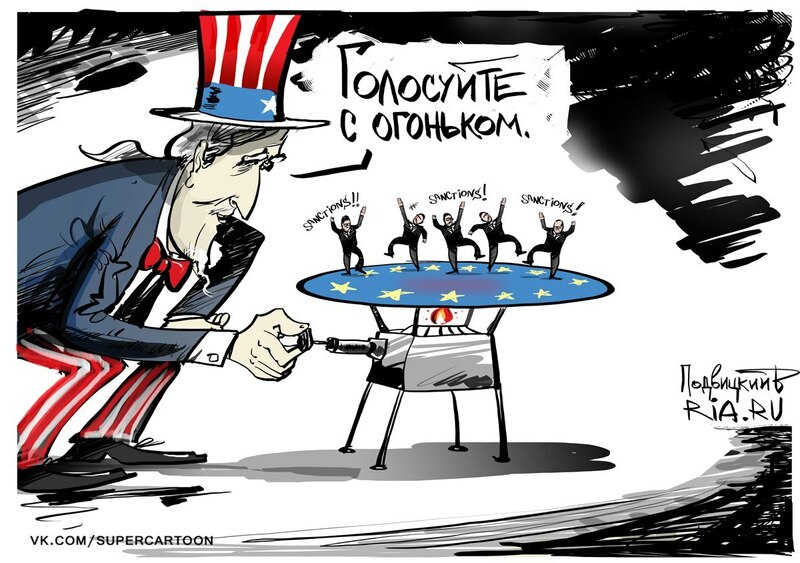 Russian state news agency RIA Novosti illustrates this idea with a cartoon: Uncle Sam is turning up the flame on a gas stove, forcing Europeans to jump up and down and cry for sanctions (against Russia, that is). Examples of this narrative are numerous: Ukraine is ruled by foreigners and the Baltic states are not really countries. The EU is directed by Washington. NATO and the EU are pursuing militaristic and bureaucratic ambitions, disregarding the interests of their member states and, of course, their citizens – sometimes not even by intent, but simply through incompetence or being out of touch with reality. You can decide which explanation is worse – ineptitude or malicious intent. Closely related to this narrative of lost sovereignty is that of a threatened national identity, where existential danger stems from a diverse array of sources: Islam, gay people, children’s rights, and more. Recent events suggest that these narratives can have a strong impact on audiences. European governments only accept instructions from NATO, Brussels, and Washington. Europe is occupied by the US. Germany is no longer a sovereign state. European cooperation between national governments is depicted as state capitulation to foreign rulers. This narrative has been successfully employed in several European elections and referenda. Convincing voters that their grievances are the result of resources being funnelled to “others” – foreigners, bankers, corporations, minorities – has proven to be an efficient manipulation strategy. Indeed, combined with fuelling nostalgia for a mythical national past, this narrative is one of the most damaging disinformation strategies out there. It has been deployed in connection with the Catalan independence referendum, Brexit, and in several national elections. 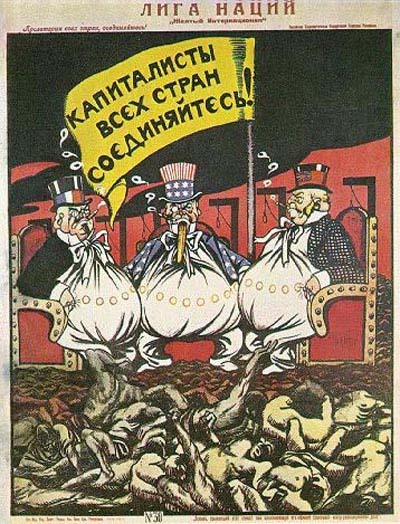 As mentioned above, Russia has been foreshadowing Europe’s imminent collapse for well over a century. Describing Europe or EU member states as “on the verge of civil war” works just as well in 2019 as it did in 1919. This is a hard-working narrative that usually resonates well with target audiences, despite the fact that Europe has not collapsed and, by many metrics, continues to flourish. 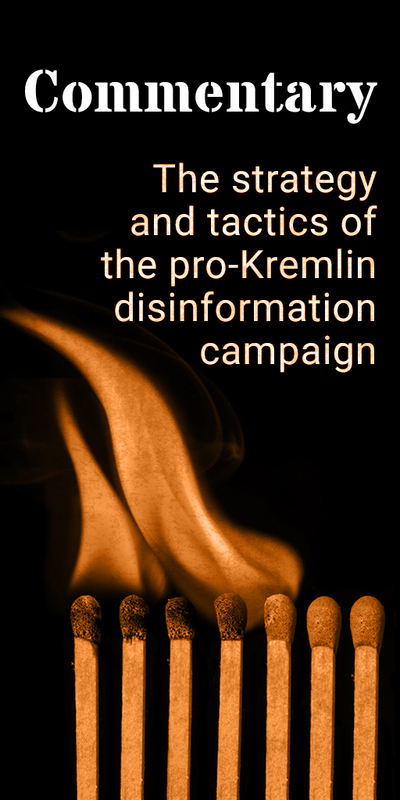 The narrative is employed regularly by Russian and pro-Kremlin disinformation outlets: The EU Superstate is collapsing, US economy is collapsing, NATO is breaking down, the Yellow Vest movement is destroying the banking system. 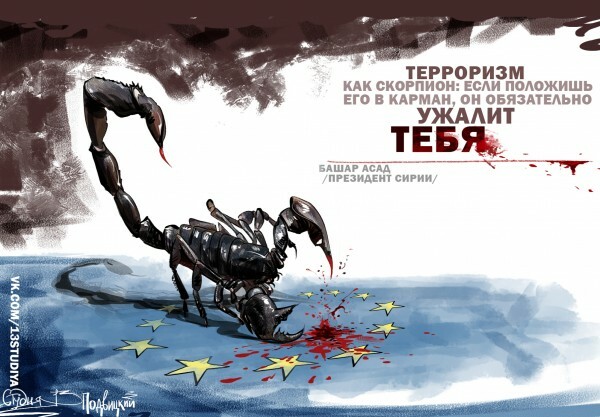 The RIA Novosti cartoonist describes terrorism in Europe as a deadly scorpion that Europeans have unwittingly placed in their pocket. Target audiences that – legitimately or not – already fear political and social turmoil in their countries are particularly susceptible to this narrative. Thus, this narrative works especially well during periods of real political challenge, like during the migration crisis in the fall of 2015. The enormous influx of migrants to Europe certainly posed a major challenge to European governments, but the Russian and pro-Kremlin media portrayed the situation in grossly overstated and apocalyptic terms, reporting about the crisis as though it constituted a systemic collapse. Of course, the system survived intact, but the image of Collapse lingers on. The same approach is visible in Russian and pro-Kremlin coverage of the Yellow Vest protests in France. The right to express discontent with government and politics is an integral part of democracy, and the citizens of any European state enjoy the right to take to the streets. The Yellow Vest movement belongs to the European democratic tradition, and is not proof of the breakdown of the system. This narrative is also sometimes used to lament the alleged breakdown of European moral values and traditions. Russian and pro-Kremlin disinformation outlets for instance regularly describe children’s rights in Europe as an attack on family values. Europe is dying, abandoning all decency and morals. A final resort in disinformation, typically when confronted with compelling evidence or arguments, is to joke about the subject. The Skripal case is an excellent example of this strategy. Russian and pro-Kremlin disinformation outlets have attempted to drown out the assassination attempt with sarcasm to turn the entire tragedy into one big joke. More generally, in connection with elections, this method involves the use of various derogatory words to belittle the concept of democracy, democratic procedures, and candidates. Kremlin aide Vladislav Surkov describes the concept of democracy as “a battle of bastards” and instead recommends the “enlightened rule” of Vladimir Putin as an alternative for Europe. Ukrainian President Petro Poroshenko is almost constantly ridiculed in pro-Kremlin media, as is Ukraine’s entire election process. According to Russian state media, an election with several candidates and no obvious outcome is considered a circus. Of course, satire, humour, and parody are all integral components of public discourse. The right to poke fun at politicians or make jokes about bureaucrats is important to the vitality of any democracy. It is ironic, then, that Russian and pro-Kremlin disinformation outlets often seek to disguise their anti-Western lies and deception behind a veil of satire, claiming it is within their rights of free speech, while aggressively refusing to tolerate any satire that is critical of the Kremlin or undermines its political agenda. An example of this hypocrisy is Russia’s ban on the 2018 British comedy The Death of Stalin. In a 2017 report, NATO’s StratCom Centre of Excellence published a report explaining how Russian and pro-Kremlin disinformation outlets use humour to discredit Western political leaders. One of its authors, the Latvian scholar Solvita Denise-Liepnice, has suggested the term “hahaganda” for this particular brand of disinformation, which is based on ridiculing institutions and politicians. The goal of hahaganda is not to convince audiences of the truth of a particular joke, but rather to undermine the credibility and trustworthiness of a given target via constant ridicule and humiliation. The five narratives, as we can see, are closely related and share the over-arching theme of disempowerment driven by “evil elites”. National governments are weak and ineffectual; citizens are disenfranchised, their traditions face destruction – and by whose hand? Bureaucrats in Brussels, corporate businessmen, shadow rulers, and of course, fascists! In contrast to this chaos, insecurity, and moral decay across Europe and the West, Russia is depicted as a source of paternal security and stability. In fact, leading Russian voices even advocate Russia’s regime of “enlightened authoritarianism” as an ideal political system for the future. Another shared feature of these major narratives is that they attack Western democratic institutions and legal systems in order to foster distrust and social fragmentation, with the ultimate goal of subverting democracy. This strategy of cultivating distrust is designed to convince citizens that their participation in the democratic process is meaningless: voting is futile because the system is “rigged” in favour of elites and only exploits ordinary citizens. Thus, democracy is portrayed as a farce that is moreover inefficient and ill-suited to address contemporary challenges.